Danny McBride is one of my favorite working actors right now. He is a diamond in the ruff and I could not be happier that he has found all of the success he deserves. 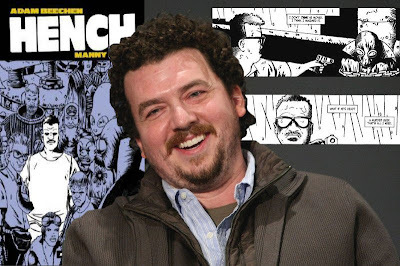 This week came news via Variety that McBride is working alongside Eastbound and Down writer Shawn Harwell for Warner Brothers to make a feature film of the independant comic "Hench". What makes this news so good is that McBride is developing the script for himself to star in, even better he is pushing WB to allow him to use some of the DC villains for the script! Hench is a comic written by Adam Beechen and Manny Bello which follows a football player who suffers from a career ending injury. With a wife and kid at home, the ex-player still needs to pay the bills and with no where else to turn, he becomes a henchman for various supervillains including the Red Baroness, the Cosmonaut and Hellbent. The comic is dark in nature with heavy comedic and cynical undertones that deal with the culture of violence and the superhero mythos in one sweet package. Hench furthermore makes for an overall enjoyable read and is a must for any comic fan. The story and character are a perfect fit for the talents of Danny McBride, who could easily take on the role of Mike, the ex-jock who turns to a life of henching with no where else to utilize his talents. The character will also not be that big of a depature from McBride's recent role on HBO's Eastbound and Down eventhough in Hench, the ex-player angle is very minor to the overall story. The idea that McBride is pushing Warner Bros. to allow him to use some of the DC Universe villains makes the story and film that much more intriguing. McBride told CHUD at a recent "Land of the Lost" press junket that he'd like to do a comedic tie-in to the upcoming Supermax project with "Hench". How sweet would it be to see McBride henching for say Lex Luthor, Captain Boomerang, Heat Wave, Calculator and others. I would venture to think that Batman baddies might possibly be off limits, but Superman, The Flash and other superhero nemesis shouldn't be too hard gain access to and furthermore could benefit from the exposure.